Build the body and strength you always wanted. StrongLifts is your personal trainer. Get the simplest, most effective workout plan to get stronger and build muscle. Rated 5 stars by thousands of users. • Used for 3 months! Excellent results 285lb squat! • I've gained 8 pounds of muscle in 3 months. • After 12 weeks I'm now aiming for the 300lb squat and getting my bench above 220lb. • In 3 weeks my squat has gone up by 45lb. It's an exercise I've struggled with in the past, but now it's one of my favourites. • Being middle aged, overweight and never lifted weight this was what I needed. I am gaining muscle and strength, losing inches on the waist and squatted 220lb for the first time. I am more than happy. 4. Follow the workout plan, and build strength and muscle! Stop wasting time in the gym, and start getting results. The StrongLifts 5x5 workout plan only takes three workouts a week of 45 minutes each. It's simple but effective..
Download StrongLifts and try our free workout plan. Upgrade to Pro for even better results with warmups, plate calculator, assistance exercises, and more. 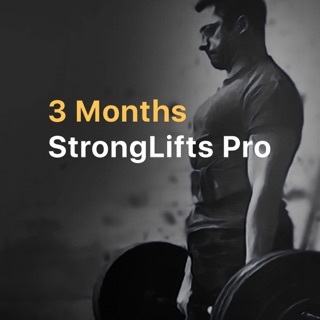 StrongLifts Pro can be purchased for three months or yearly. Payment will be charged to your iTunes Account at confirmation of purchase. Subscriptions automatically renew at the end of the period, for the same price. You can turn off auto-renewal at any time up until 24-hours before the end of the subscription period in your Account Settings. When you cancel the auto-renewal, access to the Pro features will not expire immediately, you will have access until the end of the current payment period. Our goal is to build the simplest, most effective way to build strength and muscle. 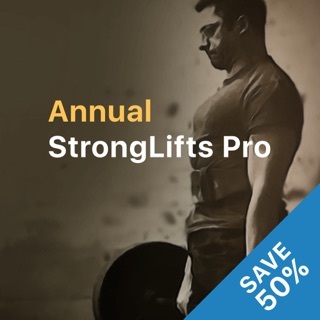 We improve StrongLifts using your review and feedback. This is how we help you get "5-star" results in the gym. • Added invite for v2.10. Click to get access. I have tried many workout routines starting at 14 and going till I was 24. I was always trying to find a good fit. I spent a year just sitting at my computer playing games and eating garbage, I am now very out of shape at 25. I wanted to find a workout that made me feel like I was really doing something with my time and that made me stronger and better in daily activity’s, one that will hopefully help me turn my health around. I work in air conditioning sales and installation it’s hard sometimes to fit a good workout in. That’s why I like the 3 day a week setup this program recommends. Also the 45 min to 90 min workouts are not too intense with the rest cycles, but are tough because of the heavy weight. If you are like me you will get impatient the first two months because for that time it felt like the weight was too easy, but I stayed with the program and at the end of the 3rd month I was benching more than my old max weight for 5 sets of 5 not many programs are that fast I tried the 4 day split for a long time and made those kinds of gains in twice the amount of time. So I like the efficiency of the program and the app is so easy to use anyone can do it with less than 10 min playing with it. I did stronglifts before years ago before my fitness life took a detour into crossfit. But recently I've concluded that for most schedules and budgets stronglifts is all that you really need. It's blindingly simple, easy to start and stick to, and most importantly IT WORKS. Now, in the past I tracked my progress with a clunky spreadsheet on the phone. It was fine but not ideal. This app has transformed that. There is no typing involved. No planning ahead. Just show up to your gym, open the app, and start checking off completed sets. If you're a novice let me tell you: exercise is actually the easiest part of working out. The hard part is getting started and then sticking with it. At least for me, this app has made those challenges way easier to overcome. Oh and always remember to warm up. The pro version of this app will help you do that too and if you're already paying for a gym membership the additional cost should be basically negligible. Between the app with the Pro upgrade and the awesome website, you can’t go wrong unless you don’t follow the program or you lack the drive. I’ve been training for over 20 years. An injury took me out of the gym for a while. Using 5X5 StrongLifts got me strengthened again to the point I was back to weight training with no problem. I started at a low weight. A weight that could. E considered embarrassing at the gym. I mean 95lb squats and bench press. But I followed the program and I was up to bench pressing 315 lbs 5 times and squatting 405lbs 5 times in a matter of 6 months. It’s only three times a week. If all you can do is Saturday and Sunday and one day during the week, then you’re doing the program. With time, I added assistant exercises. I grew bigger and my body fat decreased. I love 5X5 StrongLifts and recommend it to my friends and people on Facebook bodybuilding groups I belong to. There’s a reason it has the high review score that it does. Enough said!